To keep things easy and causal, send out text invites. A few weeks before my ideal party date I’ll send out a group text saying, “Saturday or Sunday?” That’s it. If I ask for any more, it gets way too messy trying to combine everyone’s schedules. Divvy up the duties and stick to a potluck spread! My group usually chimes in on what they want to bring (in our group text) and my husband and I handle the big items, like the turkey and mac and cheese. His baked mac and cheese is so good it literally won an award. The other must-haves are my grandmother’s potato salad and homemade sweet potato pie, cranberry sauce (love it or hate it! ), collard greens, ham and mashed potatoes. If anyone brings doubles we have a contest to see whose recipe is better. We’re a very competitive group. BYO is the best way to go. Everybody brings Bud Light or a bottle of wine and I make a signature cocktail. My husband and I met bartending so we both love to show-off our skills during the holidays. I’m known for my strawberry daiquiris (they’re good any season, not just summer!) and he makes fruit-infused tequila. Having a mixture of beer, wine and spirits is essential to ensure there’s a little something for everyone. A playlist is a must and will totally set the tone of your soiree. However, I steer clear from crafting the playlist (mine would go from Lil Wayne to Kenny G, not always a crowd pleaser), and let my friends take the reins. 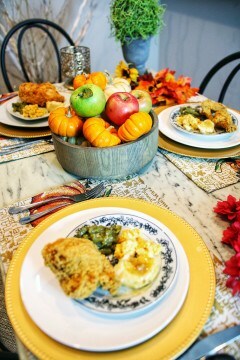 The only “traditional” part of our day is that we turn the music off during dinner, sit down to eat (instead of eating buffet style) and go around the table saying what we’re thankful for. After the meal, we crank things back up again with Drunk Jenga, Cards Against Humanity, What Do You Meme? and Twister. 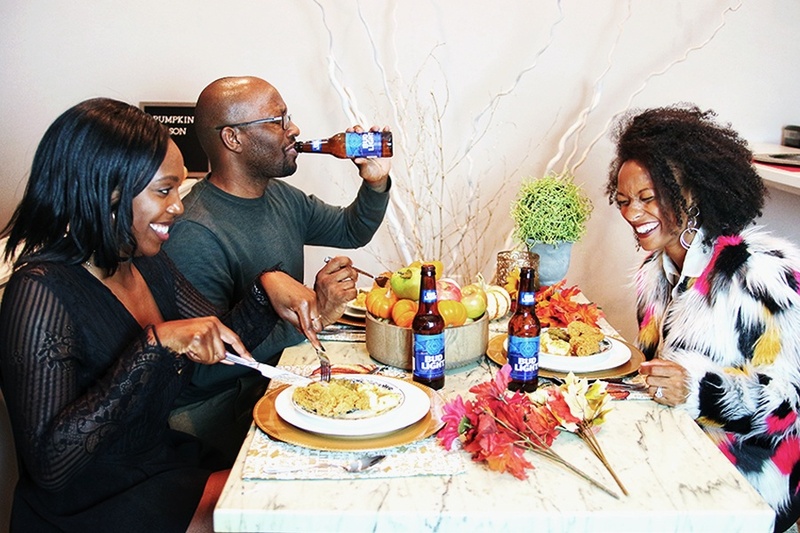 Just as you would with your family, try to create set traditions with your friends, too. Every year you can count on two things at my Friendsgiving—a diverse group of friends and food (Dominican, Afghan, American, Spanish) and our punishment shots. The last person to show up to dinner has to do a punishment shot of one of my husband’s infused tequilas or whiskeys. They’re delicious… but dangerous. 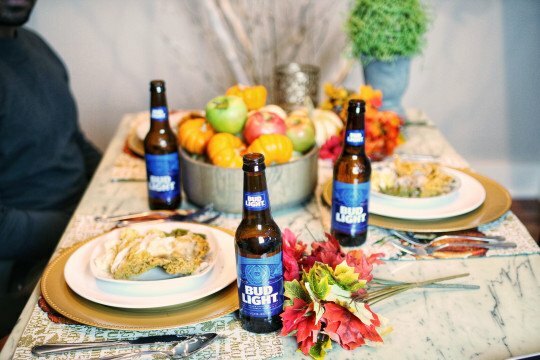 Grab your besties and toast to the season over an ice-cold Bud Light— the beer you can always count on.